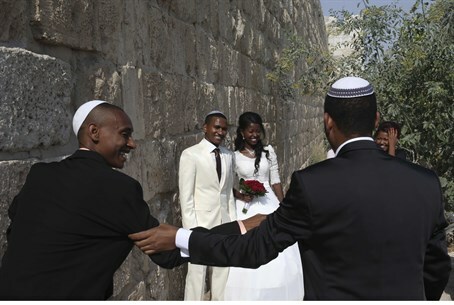 Zionist rabbis' group decried the refusal of city rabbis in Petah Tikvah to register members of the Ethiopian community for marriage. Rabbis of the religious-Zionist Tzohar organization decried the refusal of city rabbis in Petah Tikvah to register members of the Ethiopian community for marriage. According to reports, Ethiopian community members who seek to get married in the city are sent elsewhere. In Israel, all marriages must be officiated by a religious official – depending on the couple's religion – in order to be officially recognized. Jewish marriages are conducted by ordained Orthodox rabbis who are recognized and licensed by the Chief Rabbinate. In general, couples register with the Rabbinate for a marriage license in the town in which they live. According to reports, the Petah Tikvah rabbis have been referring Ethiopian couples to rabbis from Tzohar, telling them to seek out the organization and use their services if they wanted to get married by a rabbi. The Petah Tikvah rabbis did not give a reason for their stance, but the Tzohar group said that the rabbis had an obligation to marry all Jews, no matter what their background. “Nowadays assimilation is rampant and many couples choose to marry outside the framework of Judaism,” the group said in a statement. “The Petah Tikvah rabbis are of their own volition excluding perfectly kosher Jews who seek to marry within that framework. “Tzohar calls on the Chief Rabbis of Israel to demand that those responsible for this situation respect the regulations and register all Jews, and most importantly treat them properly,” the statement said. In response, the Chief Rabbinate said that “the law requires the Rabbinate to provide services to all Jewish citizens without discrimination of any kind. If these regulations have been violated an investigation will be undertaken, and the issue will be dealt with.” The Petah Tikvah Rabbinate had no comment. It should be noted that Rabbi Ovadia Yosef z”tl declared unequivocally nearly four decades ago that Ethiopian Jews should be considered Jews to the same extent as members of all other Jewish communities. The fact that the Ethiopian community had been cut off from world Jewry for centuries was not an issue, Rabbi Yosef said.